You are here: Home / Blog / Wine with Winston / Wine Diamonds! Let it be known that an old dog can always learn new tricks! The other night, Mom and Dad had just popped open a bottle of our newest white wine, Petit Manseng, and I heard them start talking about the wine diamonds. What?! Diamonds in wine? Now, believe me, having been the overseer at many a wedding here at the vineyard, I have seen my share of diamonds, but I have never seen any come in a wine bottle. 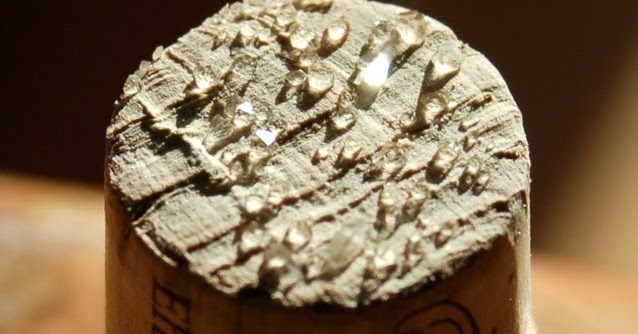 “Wine diamonds” is a term that wine industry folks use to refer to the tartrate crystals that form when tartaric acid bonds with potassium chloride. The resulting product is potassium bitartrate. 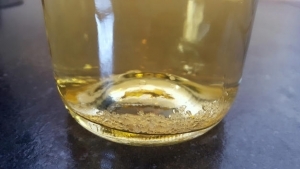 Before I get too involved, let me start off by saying that there are three acids that are always present in wines: malic, citric, and tartaric. Citric acid is pretty neutral and is used mainly to increase acidity and as a natural preservative. The malic acid goes through malolactic fermentation which creates the creamy, buttery texture associated with some wines. Tartaric acid stabilizes the wine and helps make it more suitable to aging. 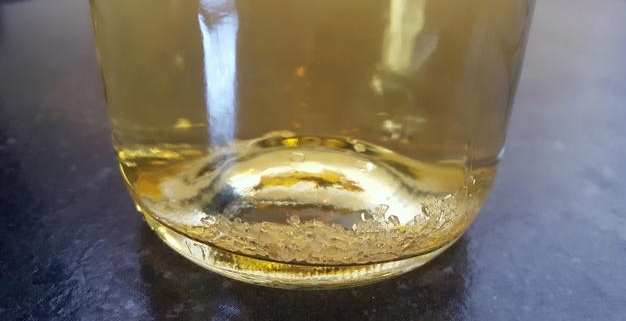 While some people don’t like seeing the tartrate crystals in their wine, please know that they are actually a signal to you that the wine is of a higher quality, has had less manipulation in the processing room, and the wine will age better. These crystals occur when the temperature of a wine drops below 40⁰ F and the potassium chloride and tartaric acid come together. Formation of crystals can be avoided in two ways: winemakers can use cold-stabilization techniques at the end of the processing cycle or wine drinkers can avoid placing their wine for extended times in temperatures that are below 40⁰ F.
If your wine does develop crystals, don’t be alarmed. They aren’t dangerous and they don’t have a flavor, but if you want to strain them out simply use a cheesecloth. As for me, knowing what a sign of quality these little crystals are, I will welcome seeing them in the bottles coming from our winery! https://www.brixandcolumns.com/wp-content/uploads/2018/07/diamonds-in-a-bottle.jpg 352 626 Stephanie Pence /wp-content/themes/sixpenny/images/logo.svg/ Stephanie Pence2018-06-13 18:40:092018-07-19 15:40:57Wine Diamonds!